The Magazine Committee of the Government Law College, Mumbai feels that the best means to explore the real lawyer within its students would be to allow the development of the writer beneath his persona. 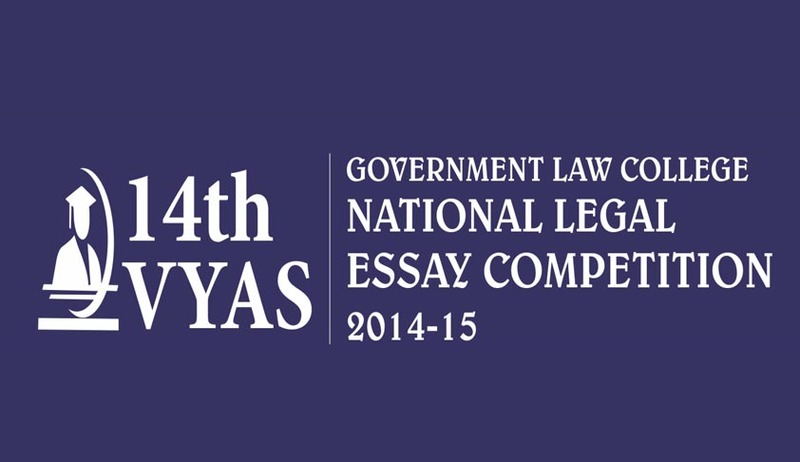 Hence, the Committee organises the Vyas Government Law College National Legal Essay Competition each year. The competition is sponsored by Mr. Dinesh Vyas, one of GLC’s most distinguished alumni, who obtained his LLB degree from Government Law College in 1967. Every year, the number of participants and quality of entries received rises manifold. This year will see the 14th edition of this prestigious competition. 1. The Right to be forgotten: the most recent dispute in data protection. Elaborate with respect to Google’s legal controversy. 2. Discuss the case of Dr. Kunal Saha v. Dr. Sukumar Mukherjee & Ors, with respect to the perpetual conflict between medical negligence and consumer protection. Analyze the crux of the judgment and development of law through the years on the same. 3. Examine the laws regulating commercial activities in outer space and the resolution of disputes in such matters. Shed light on the development of this obscure branch of international law. 4. Trial by Media: Is the fourth pillar of democracy hindering justice? Discuss in detail with reference to the detrimental reporting of criminal cases by media in recent times and the blurry freedom of expression. 5. Analyze the major provisions of the recently introduced, Juvenile Justice (Care and Protection of Children) Bill, 2014 in view of the recent incidents brutality towards women. The first prize winning entry will be published in the Annual Magazine 2014-15. Participation is restricted to students currently studying in Law colleges only. All participants must be LL.B. students, either from the 3 year course or from the 5 year course. Individuals alone are eligible to participate. An essay co-authored by two or more students will not be accepted. Word Limit: 3500-4500 words. Marks will be deducted for violation of the word limit. The identity of the student or the college, university, institution, etc., should not be revealed in the text of the essay in any manner whatsoever. The essay must contain proper footnotes mentioning details of authorities used. Font type – Times New Roman, Font size 12, Double-spacing, One inch margin on each side, printed on one side of the paper. ‘A’ Road, Churchgate, Mumbai 400020. Full name, year, college name, telephone number and postal address, personal contact number, e-mail id, postal address. The last date for entries for the Competition is the 5th of January, 2015.